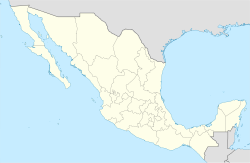 Topolobampo (Spanish pronunciation: [topoloˈβampo]) is a port on the Gulf of California in northwestern Sinaloa, Mexico. It is the fourth-largest town in the municipality of Ahome (after Los Mochis, Ahome, and Higuera de Zaragoza), reporting a 2010 census population of 6,361 inhabitants. The port connects the northern Mexican states through the Chihuahua-Pacific Railroad, which has a terminus in nearby Los Mochis. It is the eastern port for the daily car ferry connecting to La Paz in Baja California Sur. Topolobampo is also the beginning of the international trade corridor, "La Entrada al Pacifico", that ends near the Midland-Odessa, Texas area. Topolobampo was the site of a Radical "utopian" colony inspired by Henry George's economic ideas. The experiment had an influence on the urban planning ideas of Ebenezer Howard. That utopian group published a newsletter in English, The Credit Foncier of Sinaloa in Topolobampo. The masthead says "Collective ownership and management for public utilities and conveniences - the community responsible for the health, usefulness, individuality and security of each. - Albert K. Owen." A copy of two pages of one edition (vol. 4, no. 24, September 1, 1889, whole no. 161), has been preserved at Western Reserve Historical Society in Cleveland, Ohio, pasted into a Wallace Cathcart scrapbook on Shakers, Shaker ms. XIII:47, p. 13. Those two pages include an article on the Tyringham Shakers and correspondence from several prospective members. Topolobampo has a tropical arid desert climate. The sea experiences lows of 66 - 68 °F during the winter months, and highs of 84 - 88 °F during the summer months. ^ "Estado de Sinaloa-Estacion: Topolobampo (SMN)". Normales Climatologicas 1951–2010 (in Spanish). Servicio Meteorologico Nacional. Retrieved 20 April 2015. ^ "Extreme Temperatures and Precipitation for Topolobampo 1962–2000" (in Spanish). Servicio Meteorológico Nacional. Retrieved 20 April 2015. ^ Copyright Global Sea Temperatures - A-Connect Ltd. "Topolobampo Sea Temperature January Average, Mexico Water Temperatures". World Sea Temperatures. Topolobampo Collection MSS 106. Special Collections & Archives, UC San Diego Library.